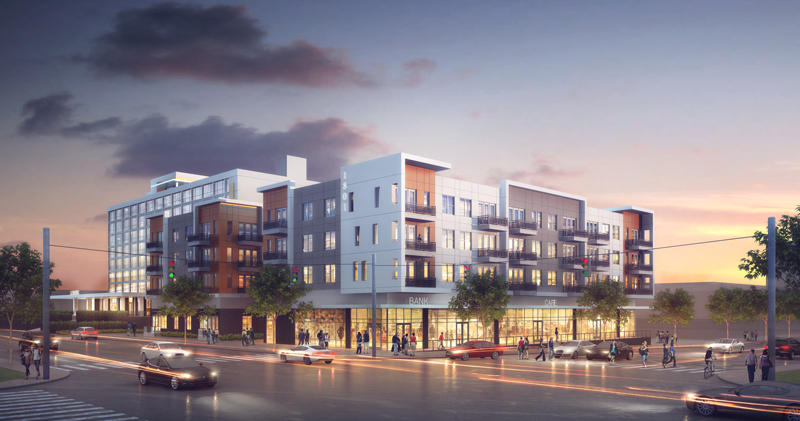 A revised rendering of the Midtown Market development planned for the southwest corner of Union and McLean now includes keeping the old Artisan Hotel as an apartment building. Source: LRK Inc. The proposed Midtown Market mixed-use development at Union Avenue and McLean Boulevard has changed as its developers continue to seek financing and adjust more than a year after they unveiled the ambitious but tentative plan. Developers Belz Enterprises and Harbour Retail Partners outlined the smaller scale of the project, which would cost $33.5 million instead of the original $43.5 million, in a memo to the Center City Revenue Finance Corp. Under the new plan, the vacant eight-story Artisan Hotel will be renovated into a 175-unit apartment building; the original plan had called for the hotel to be demolished and a new 188-unit apartment building to be built in its place. The adjusted plan still calls for demolition of the Towery office building at the southwest corner of the intersection, with new commercial space to be built there. And the developers still intend to bring a “national gourmet store into the anchor tenant position of the retail,” according to the memo. Belz HRP Partners is seeking a revision to the 15-year payment-in-lieu-of-taxes incentive approved by the CCRFC in October 2015. The CCRFC board takes up the matter at its Tuesday, Feb. 14, meeting. Because the Artisan wouldn’t be demolished under the revised plan, the size of the commercial development would decrease from 30,500 square feet to 27,500 square feet. That includes 9,541 square feet of small shop retail and 17,904 square feet of existing retail and restaurant space. The retail strip further west on the Union Avenue side would remain and be renovated. Plans for 513 parking spaces split between apartment residents and retail customers have been decreased to 288 total spaces on a new surface parking lot and using the existing parking on site. The CCRFC board also will consider Tuesday a 15-year PILOT for the $14.2 million Wessman Development hotel project in South Main. The California developer is renovating the five-story building at 477 S. Main St., which most recently housed the Memphis College of Art graduate school, as a 62-room boutique hotel including two restaurants and meeting space. A adjoining parcel behind the hotel, at 484 S. Front St., is to include 5,500 square feet of retail space and 90 parking spaces for the hotel – with some of that parking in the warehouse, the rest of it surface parking. Also on Tuesday’s CCRFC agenda is an update on the renovation of the Universal Life Building at Danny Thomas Boulevard and Martin Luther King Jr. Avenue by Self Tucker Properties LLC. Self Tucker is seeking an extension of the deadline for closing on the PILOT lease for the historic building. The one-time home of Universal Life Insurance Co. represents a pillar of the city’s black business and civic establishment during the era of racial segregation by law in Memphis. When the renovations formally kicked off in late 2015, then-Memphis Mayor A C Wharton planned to move the city’s minority business offices to the building. However, current Mayor Jim Strickland has said he’s not sure if the city will be a tenant there.